MARRAKESH – The Marrakesh E-Prix, the second to be held on the challenging Circuit International Automobile Moulay El Hassan in Marrakesh, witnessed a stellar fight at the front of the field between Sebastian Buemi's pole position sitting Renault, Sam Bird's DS Virgin car and Mahindra Racing's very own Felix Rosenqvist, kicking himself for an error on his super-pole qualifying lap which probably cost him three points. These three rapidly pulled away from the rest of the pack, while after a strong opening lap, Nick was already fighting on the fringes of the top ten. Biding his time, Felix made his move on Bird just before the halfway mark in the race and he immediately started to apply some real pressure on Buemi's Renault. An uncharacteristically slow pit-stop saw the Mahindra driver lose some ground to the Swiss leader, but the Super Swede reeled his adversary in before pouncing with a well-executed move with just 4 laps to go. Buemi had no reply and Felix brought his car home for a popular and thoroughly deserved win, his second in succession to take the championship lead for the first time. Meanwhile, Nick emerged from a frantic scrap for the points-paying positions, crossing the line in a superb 8th position (later elevated to 7th after a time penalty was applied to Maro Engel of Venturi). Nick's battered car faced stiff competition during the heat of the battle, but the car was strong enough and the driver brave enough to complete a great result for the team after a rare mistake in qualifying saw Nick start 18th. We now head to South America and the first ever E-Prix in Santiago next month with an 17-point cushion over nearest rivals DS Virgin Racing (the first Indian team to ever lead an FIA championship) and Felix will take a 4-point advantage over his pursuers to the Chilean capital in three weeks' time. Nick Heidfeld is now 7th in the drivers' championship. "I'm happy that our unfinished business from that last season in Marrakesh is now done, we can now close this chapter and move forward. It's extremely exciting to be on new territory for us, leading both championships! It's only going to keep motivating the team more and more, and it's something we need to maintain and be consistent with till the end of the year." "It was an eventful race, and was tough driving out there today, my car was quite damaged, due to my qualifying crash. I was able to overtake some cars on the start lap, and later on in the race though I was overtaken, I managed to get my positions back again. I crossed the line 8th, but gained a position due to Maro Engel's penalty that he received for crashing into me. The aim was to finish strongly and keep the car in one piece while not doing anything risky." "It was a day of teamwork, showing that every person in this team has put their best effort in. It was a crazy weekend with pitstop times being reduced, and having to change the battery on my car just before the race. Free practice was a mess, qualifying was a bit of a scare, and nothing was really clear all day until the race itself and right after the pitstop. I started feeling more confident, and slowly being a more established Formula E driver, I'm learning how to manage a race. Being a race about energy, I was able to keep my calm, be efficient, my engineer told me what to look out for, and I was able to get there in the end. It's great how we turned it around, ended up on the top step, we're celebrating it, because I honestly didn't expect it in Free Practice 1 today." The next race takes place on February 3rd, 2018 in Santiago, Chile. The inaugural race in what is often referred to as the world's Lithium ore capital will host the 4th round of the ABB FIA Formula E Championship. Simulator prep will be crucial and Mahindra Racing are looking for more podiums, wins and of course, the road to victory in Season 4. 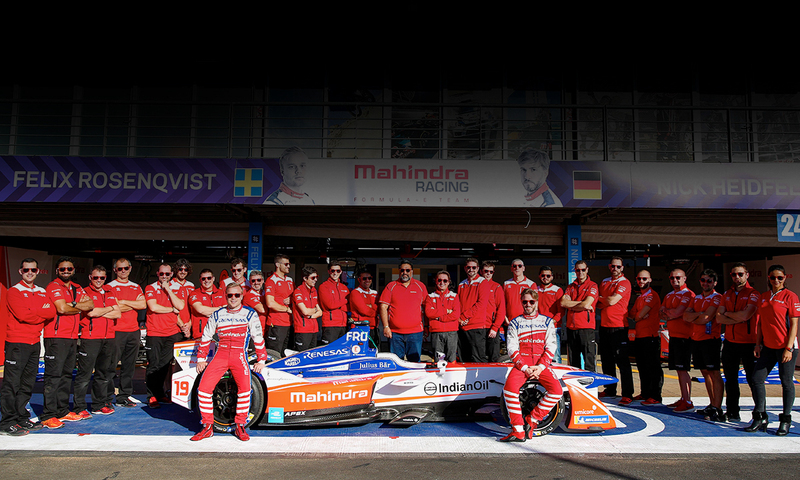 Mahindra Racing is one of ten founding teams – and the only Indian team – to compete in the FIA Formula E Championship, the world's first all-electric racing series. The M3Electro race car, launched for season 3 which concluded in July 2017, proved to be a competitive package getting the team's first race win, a total of ten podiums, three pole positions and two fastest lap awards. With these strong results, Mahindra Racing secured third place in the Teams' Championship and rookie driver Felix Rosenqvist took third in the Drivers' Championship. For Season 4, commencing in Hong Kong in December 2017, the team has high technical and sporting ambitions with its newly developed M4Electro race car that pushes the limits of technology and innovation. The ABB FIA Formula E Championship is the electric street racing series and the world's first fully-electric international single-seater category in motorsport. Formula E brings electrifying wheel-to-wheel action to some of the world's leading cities, racing against the backdrop of iconic skylines such as New York, Hong Kong, Paris and Rome. The inaugural season of Formula E sparked into life in September 2014 around the grounds of the Olympic Park in Beijing. The fourth edition of the ABB FIA Formula E Championship will see 10 teams and 20 drivers compete in 11 cities spanning five continents in the fight to be crowned Formula E champion. Hong Kong hosts the season-opener over the course of two days on December 2 & 3, with the championship coming to a close in Montreal on July 28 & 29. Formula E is a competitive platform to test and develop road-relevant technologies, acting as a catalyst for sustainable mobility solutions - helping refine the design and functionality of electric vehicle components and improving the driving experience for everyday road car users all over the world. For this season, more manufacturers have joined the electric revolution with reigning champion Lucas di Grassi looking to defend his title behind the wheel of the Audi-backed ABT Schaeffler team. More big-name manufacturers have also committed to race in Formula E - including BMW and Nissan in tandem with the new-look car and battery in season five, along with Mercedes-Benz and Porsche who also plan to join the following year. 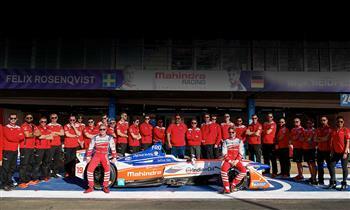 The Mahindra Racing team with the M3Electro race car.